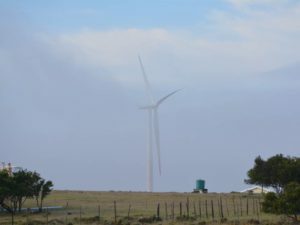 The area between the Tsitsikamma and the Van Stadens Rivers (the entire Kouga coastline) is known for being windy, so it is not surprising that developers in the new renewable energy industry have seen the opportunity it offers for putting up wind farms. The first wind farm built here is the Jeffreys Bay Wind Farm, between Humansdorp and Jeffreys Bay, and this is the biggest wind project in the country so far. There are 60 Siemens turbines, each with a 2.3 megawatt capacity. The towers are 80m tall, and each blade is 50m long. The wind farm covers 3 700 hectares and 8 farms, and it started operating in March 2014. It is owned and operated by Globeleq (whose head office is in London), with a number of South African investors. The second wind farm was the Kouga Wind Farm, between St Francis Bay and Oyster Bay, and trail-walkers pass this wind farm as they are transported to Oyster Bay Beach Lodge for their first night on the trail. This project came into operation in January 2015. It has 32 Nordex turbines, each with a 2.5 megawatt capacity. The towers are 80m tall and each blade is 45m long. The wind farm covers 3 070 hectares and 7 farms. The majority shareholder is Standard Bank, but the project was developed by Red Cap Investments, a Cape Town company. 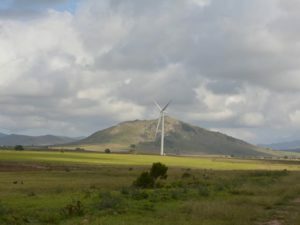 On the western side of Oyster Bay, is another project of 37 turbines, with a fourth wind farm being developed by the Tsitsikamma Community Trust in partnership with Exxaro’s Cennergi. That project will have 31 turbines. A further five wind farms are also proposed for the district, so there could eventually be nine, totalling over three hundred turbines. Farmers receive a monthly fee per turbine on their ground.